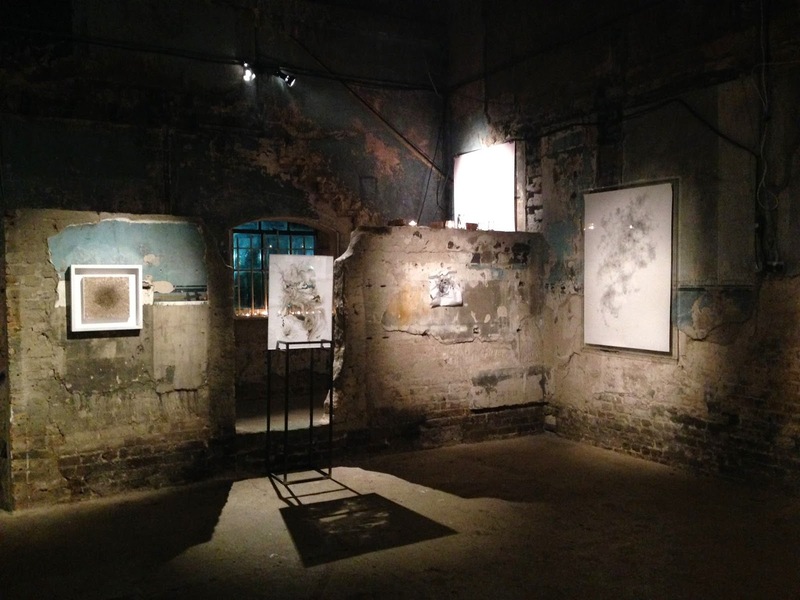 Last night saw the opening of Emilie Pugh’s exhibition, IN-TRA, with collaborator Alice von Maltzahn, who studied with Pugh and shares an interest in drawing) at Asylum London in Peckham, curated by Contemporary Key. This spectacular space, the chapel of London’s largest collection of almshouses, gutted by an incendiary bomb in the Second World War and never restored, was a fitting place to house Pugh’s ethereal works on paper. 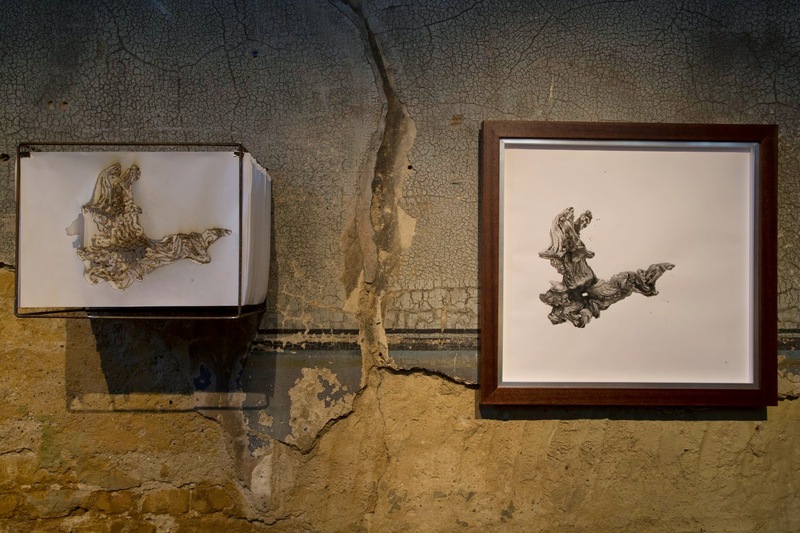 Candles uplit the degraded frescoed walls and her striking, delicate art. Pugh works slowly and painstakingly to form her images. She never sketches out each piece but instead lets each line and smouldered hole inform the next. Adding incense sticks and gunpowder to the traditional draftsman’s repertoire, she approaches the paper not as simply as surface on which to mark-make but as a medium in itself. In past works Pugh has been interested in pushing drawing to its furthest extent, burning the paper to achieve rich, dark blacks, as in the monumental ‘Anatomy of Thought’. Covering a wall in The Courtauld Institute of Art in Gampi paper, Pugh over several months worked it into fantastic billowing lines. The effect is as if an Old Master sketch has been deconstructed and the lines are scattered to the wind, left to form traces of the air; this echo of art history betraying Pugh’s interest in Old Master artwork in addition to her training at The Ruskin School of Fine Art and Drawing at Oxford University. At Asylum, while exhibiting some works by the same methods as before, Pugh has taken a more comprehensive consideration of her medium. Not only working the surface of the paper, she has developed her investigation into the ‘delicate balance between the transitory and the permanent’. Charred holes, sometimes large but often minuscule, delicate, cause the paper to gain a ephemeral state that forms and deforms and glimmers as you move around it. They evoke the trauma caused to the building that houses them and yet the steadied, deliberate act that produced them is not the indiscriminate destruction of explosive. Rather, each piece is a process of many hours of careful, repetitive work, reminiscent of Yayoi Kusama’s obsessive Infinity Nets. ‘86400 voids’ is formed of 86400 burnt holes and took the artist 24 hours to make. Pugh believes this meticulous production creates an aura around the work, expressing ‘subtle distortions’ that convey the ‘nuances of human emotions’. The works in the exhibition are all idiosyncratically by Pugh - minimal, paired down and yet expressive and captivating- but the artist approaches this in a different ways. 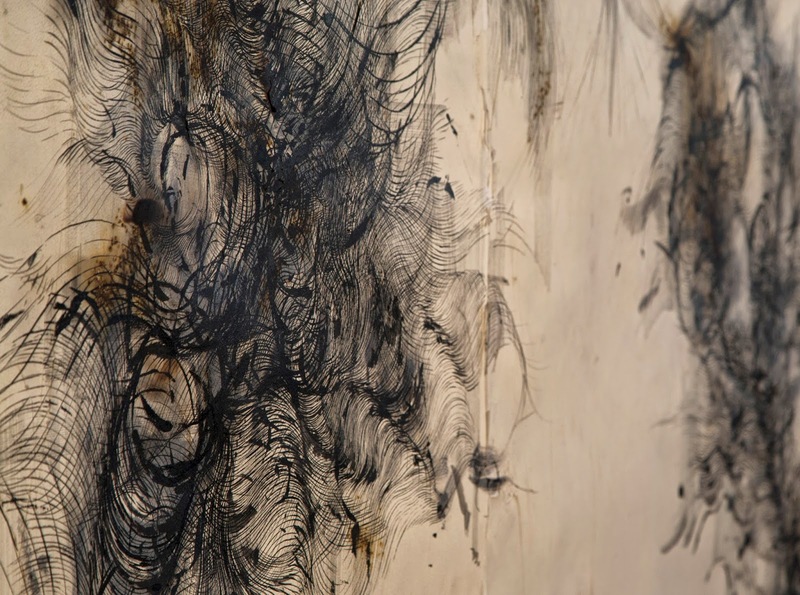 The works on paper, either charred and worked at with pen and pencil, or burnt through, are accompanied with a more sculptural approach to the material. 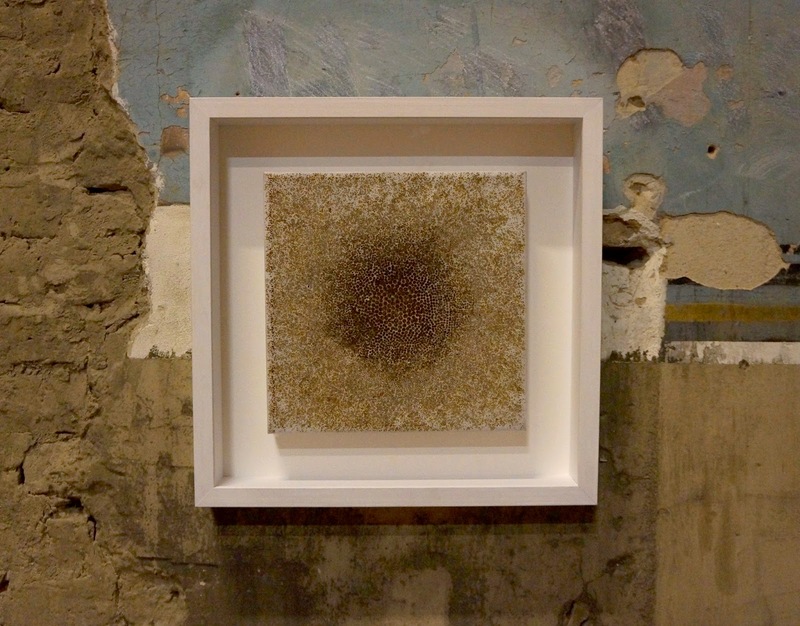 In one work, Pugh has layered the paper that she then burns though to form the an inverse topography that recedes into the frame. In another she has printed onto glass to be projected from a lightbox to great effect. In many ways, this exhibition functions as a showcase for Pugh’s continued and continuing exploration into paper and its use as a medium. Sadly, it is only running for two days but check her website for more information and her previous work.